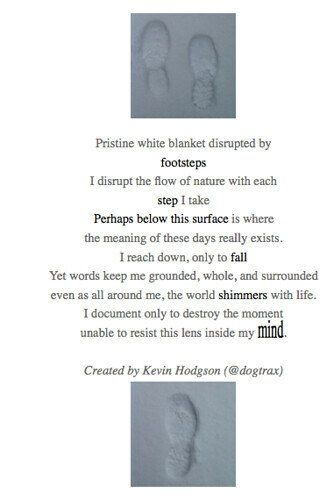 I may be wrong but it seems like we are at an important juncture in the #walkmyworld project, where the shift from documenting and sharing our worlds towards reflecting through poetry hopefully will begin. I’m not sure how ready people are, though, as that leap from putting the lens on things around us (we can be removed from the action, somewhat) to putting the lens on thoughts inside of us (poetry comes from the heart) can be difficult for many, and sharing in a public space … even more so. It brings up the uncertainty that many have of themselves as writers. Yet, if the project is to be more than just documenting, more than something than just another cute hashtag on Twitter, then I think we’ll all have to move forward, with Ian and Greg and others nudging us. Upon reading Ian’s reflections this morning, his urging of us to become more collaborative and connected with others in the #walkmyworld spaces had me mulling over how I might write a poem inspired by the tweets in the #walkmyworld hashtag, and maybe use a poem to encourage/invite/cajole others to begin some poetry themselves. My aim is to bring people into the poem itself as way to encourage them to write their own. 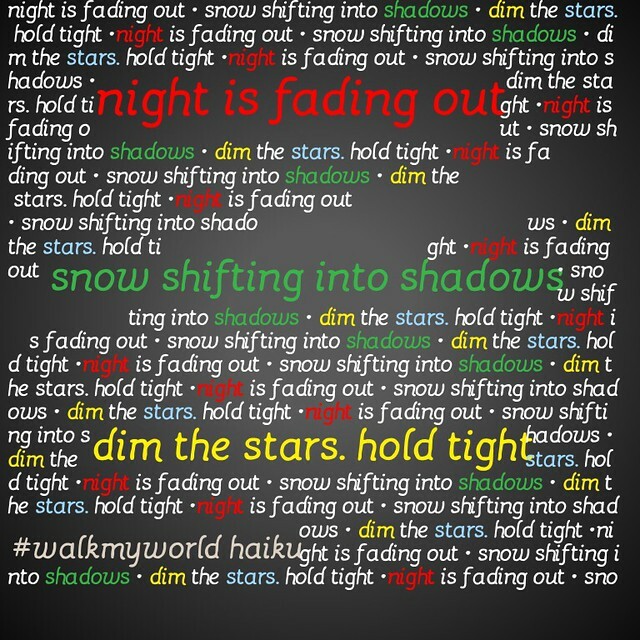 I humbly “borrowed” tweets from the #walkmyworld stream, finding inspiration within the confines of 140 characters. If you are in my poem, I thank you for your words and ideas. Write your poem, if you can. A shift is underway in the #Walkmyworld Project towards using our documentation of our world as the kernal of digital poetry. 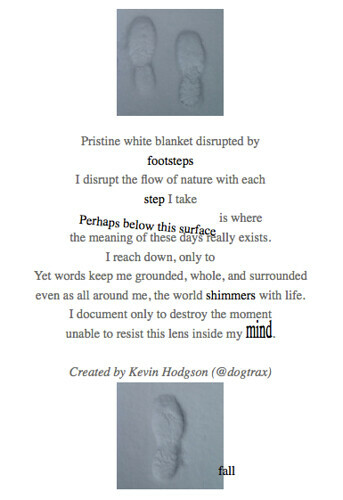 I took a shot of footprints from our back yard and wrote a poem, and then decided to try my hand at kinetic poetry (where the words/type can move). These two screenshots show the “before” and the “after” of the poem as it is played. To really experience the poem. you’ll have to go to the poem itself. I constructed it as a remix with Thimble, part of the Mozilla Webmaker suite of free tools. This kinetic text template was shared out a few months ago by some National Writing Project friends as part of MozFest in England. It allows you to really tinker with words and learn a bit about code, too. I was aiming to make words and phrases “do something” that connected to the flow of the meaning of the words and phrases. So, the word “fall” falls, and the “footsteps” grows and shrinks like a footstep walking and “shimmers” shimmers. My friend, Molly, shared out a new video app tool that is pretty nifty and cool. PicPlayPost (costs $1.99) is a collage-style app, that allows you to do a Brady Brunch-style video with smaller videos embedded in the final product. I’m still working and playing with it but my brain is working out and wondering about how to use it more creatively. Is there a way to connect videos as a poem? For now, I am just playing with some Vine videos from the #walkmyworld project. My first attempt with the app was a version of a poem that I wrote and shared yesterday about walking my dog and thinking about teaching. Here is the full poem as podcast and a link to the poem on Notegraphy. As I wrote the other day, I am curious about how to use visual infographics to tell a story. 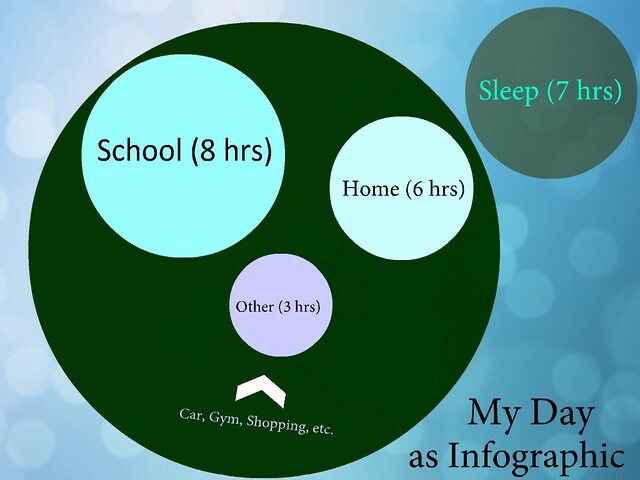 Here, as part of the #walkmyworld project, I decided to map out a typical day of mine (time spent where) and create an infographic of my day. I used an app on my iPad for the creation of it and rounded up and down a bit on the times to make them whole numbers. I also tried to use artistic design to create the face (although I now realize the mouth is frowny because of the way the arrow points. My days are not normally frowny). The sleep element I put off to the side because it felt like that state of mind is different than the waking state of mind (and the focus was on the day). If I had more space, I might have broken down the “other” a little more in specifics. But overall, I like how it came out, though, and the reflection points to just how much time I spend in school on a typical week day. Obviously, weekend would be different. (Maybe a different infographic).